I watched Doctor Who as a kid in the late 70's and into the 1980's. I was a huge fan of the show. 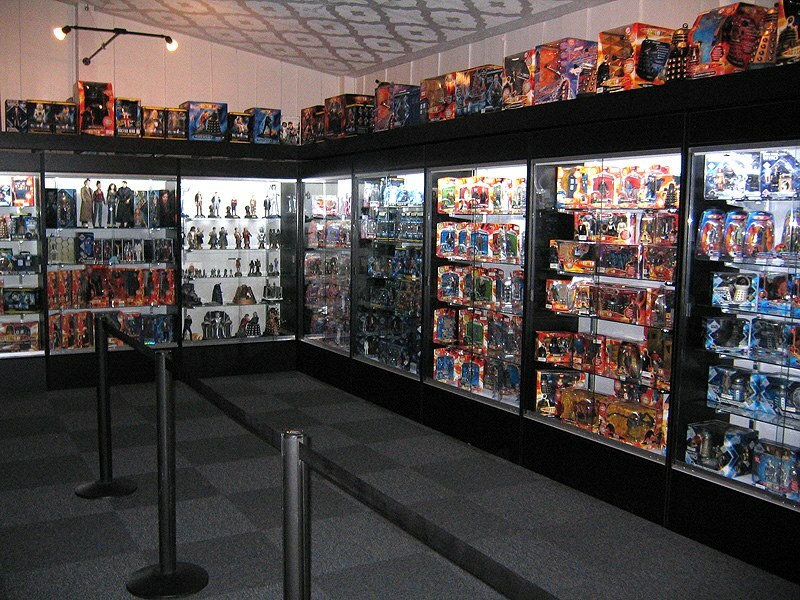 One of the things that always bothered me is that I could not find any toys or collectibles in the United States. You might find Doctor Who books in the bookstore, but there was nothing that compared with the widespread availability of Star Wars action figures, for example. When the internet started to really take off in the 1990's, I got in touch with some companies in the United Kingdom and told them I wanted to bring some Doctor Who items into the United States. Doctor Who had been off the air for a few years and it was a "dying brand" at the time, but I still loved the show and wanted to get the product. Ever since then, I have been selling Doctor Who products in the United States. But selling is not my only goal. For years, I have been setting aside product in our "museum" of Doctor Who collectibles. This has always been free for the public to browse and enjoy. 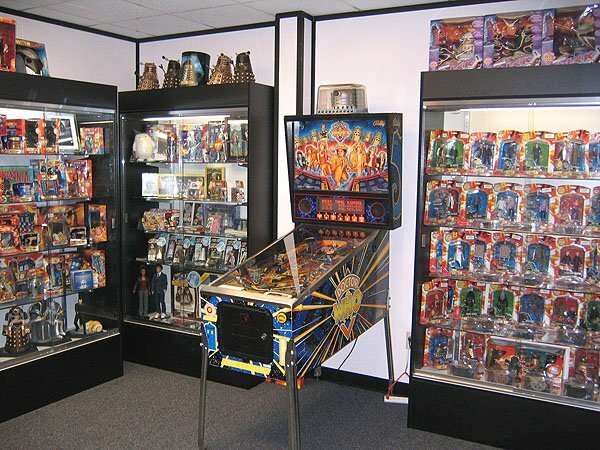 We even have a Doctor Who pinball machine on freeplay just for people to experience when they visit our facility. I have product from all the way back in 1965 when Doctor Who was first merchandised up until the present. Here's my dilemma. I need to expand our space. I need more cabinets to display product, sure, but I need a bigger facility. I just don't have the money. I need a way to offset the expenditures of a larger facility and still supply funds for sufficient space that, while it does not generate revenue, provides enjoyment to people of all ages. If you would be so kind as to consider funding this project, it would be most appreciated, and not just by me, but by everyone who gets to enjoy our facility. And if you are in the Indianapolis area sometime, we would love to have you make an appointment to visit our facility. Please contact me for more information! 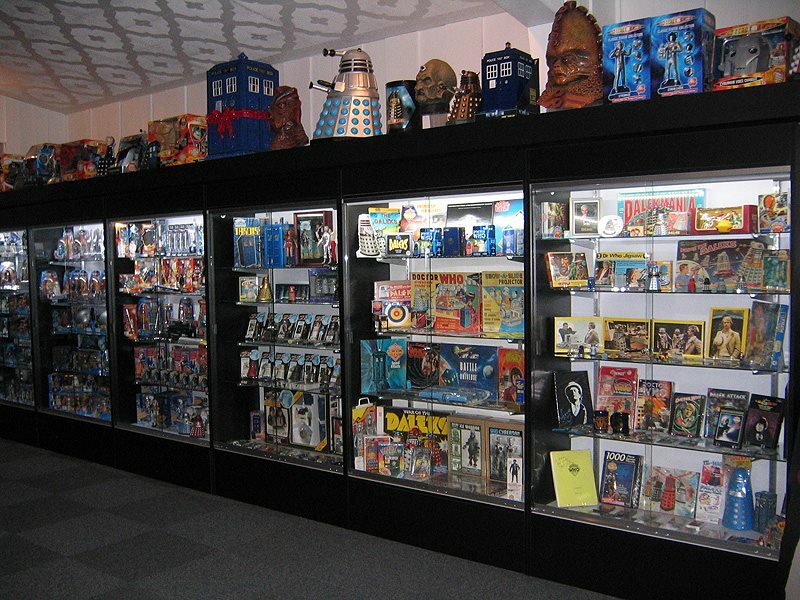 Here are some images of our newly expanded museum of Doctor Who Merchandise. We have a lot more to display, but we ran out of cabinets! An image of our new Museum section! December 19th is the last day our shop will be open to the public at this location, then we begin our move. All the money raised from this GoFundMe campaign will be going to purchase additional display cabinets in our new shop. We are looking at $5000 for our next 7 cabinets and we eventually hope to expand as funds become available. We are so thankful to everyone's continued support. Meanwhile, the building improvements are well underway and the new building will be shaping up nicely over the next month. We close on our building today... we can barely contain our excitement! While we expect 3 months of renovations following our purchase, we hope 2016 will be a FABULOUS year in our new property! Please make it dalek accessible!!! Fan of the show since 1986 here, delighted to help out.